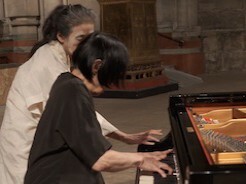 Margaret Leng Tan joins Eiko at the Cathedral of St. John the Divine to perform an experimental duet with Eiko. Tan is an avant-garde pianist whose work goes beyond traditional boundaries of discipline or genre. She embraces aspects of theater, choreography, performance, and even uses “props” in her performances. Tan brings showmanship as well as disciplinary rigor to her work, inherited from her mentor, John Cage. Tan has been featured in international festivals and recorded with labels such as Mode and New Albion. Tan has also appeared on public television, as well as at Lincoln Center and Carnegie Hall. Tan is the subject of a feature documentary by filmmaker Evans Chan, entitled Sorceress of the New Piano: The Artistry of Margaret Leng Tan. 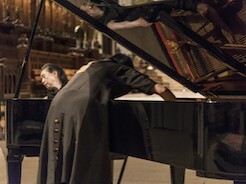 Tan collaborated and toured with Eiko & Koma in Mourning (2007) and also performed during Danspace Project’s 2019 Platform that centered on Eiko’s A Body in Places.